A plaited bracelet and necklace from silicone cord, metal jewellery chains and drop beads threaded onto a piece of copper wire. 1. 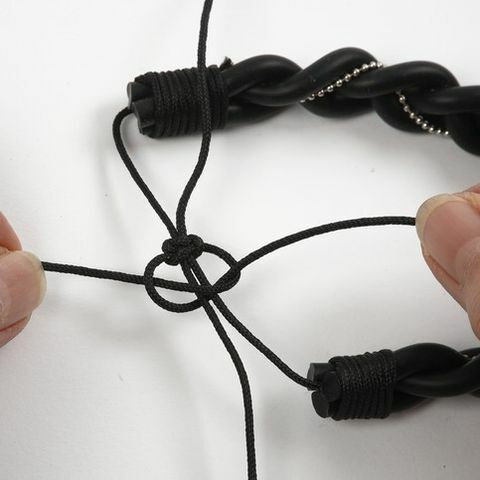 A bracelet with a braided fastening: Cut three 25-30cm long pieces of silicone cord, depending on the circumference of the wrist. Also cut a piece of bead chain same length as the silicone cords and a piece of macramé cord measuring approx. 40cm. Place the four cords side by side (with the piece of bead chain close to the middle silicone cord). 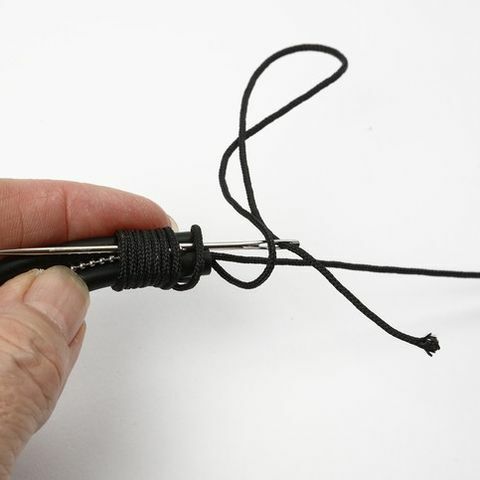 Also place the slightly longer piece of macramé cord in the middle. 2. Twist the piece of macramé cord which is placed the same length as the other four equally long cords four to six times tightly around the mentioned four cords – from left to right. 3. Thread the long end of the macramé cord onto a darning needle and secure the end by fastening it underneath the four to six twists made onto the other four cords. 4. 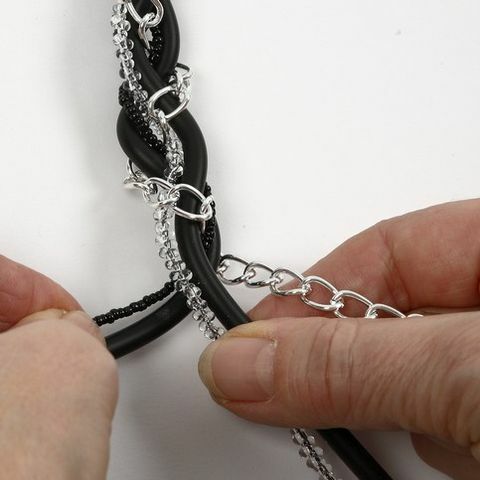 Now plait with the three pieces of silicone cord, letting the piece of bead chain following one of the silicone cords. 5. When the plait is finished, secure the plait with the macramé cord, by twisting it around this end four to six times and secure following the same procedure as under point No. 3. Assemble the two ends of the macramé cord and place them parallel. Cut a new piece of macramé cord and make a braiding. 6. 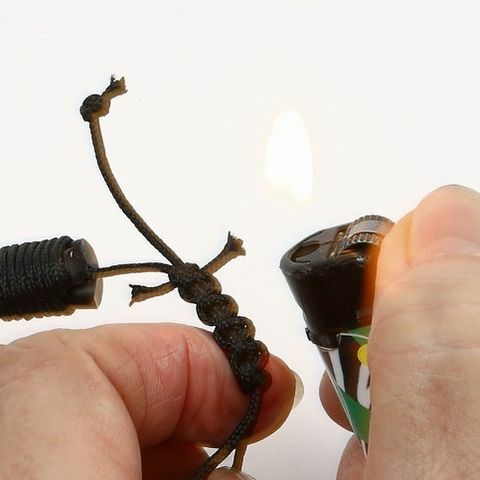 Trim the ends of the braided section and melt the ends with the flame from an ordinary lighter. 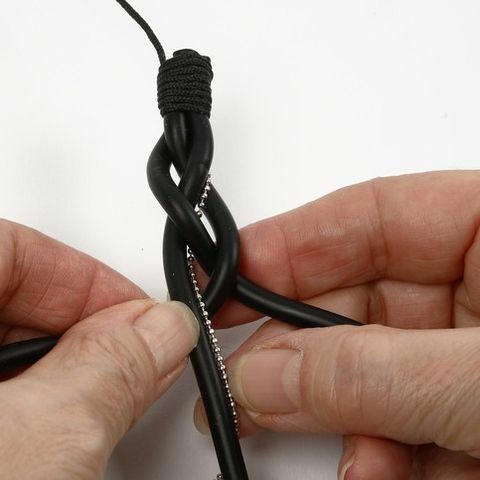 Tie a knot onto the ends, secure the knots and secure them by melting them. 7. A necklace with a swivel clasp: Thread black rocaille seed beads onto a piece of copper wire measuring approx. 55cm and clear drop beads onto another piece of copper wire of the same length. Fasten with a knot. 8. Cut two 50cm long pieces of silicone cord and an approx. 75cm long piece of jewellery chain. 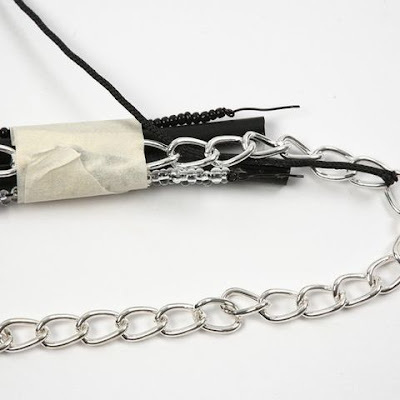 Keep the cords and chains together with a piece of masking tape as illustrated. Use the same procedure as the one described under point No. 2 and 3. Please note that the macramé cord which must be secured before and after the plaiting, should not be more than approx. 20cm long. 9. 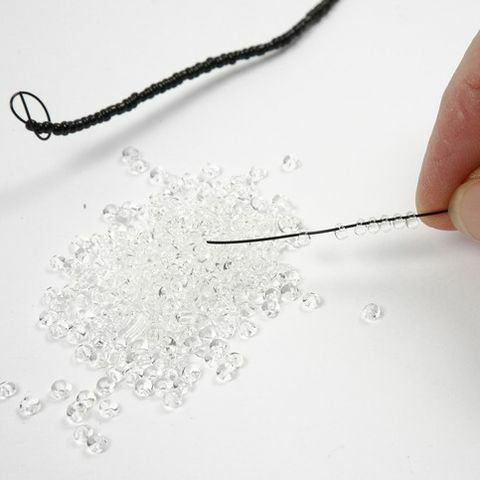 Plait following the same procedure as the one used for making the bracelet (see point No. 4). 10. 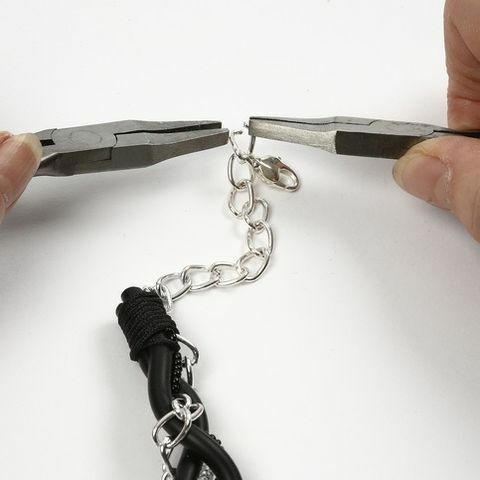 Use a pair of pliers for opening the chain. 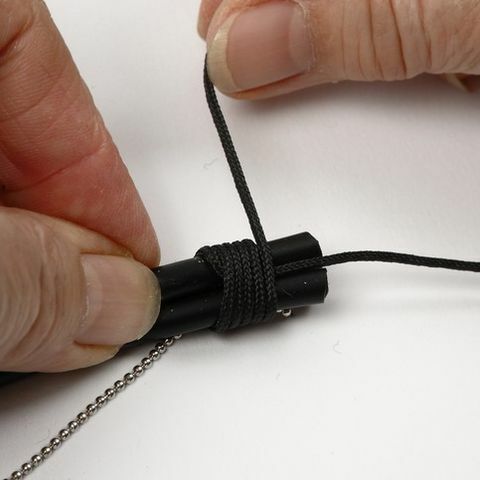 Attach a swivel clasp to the open link of the chain.